Are you a fan of dimpled jugs or a perhaps more of a straight person? Maybe you’re partial to a shaker, a nonic, a chalice or a tulip? Do you not care a jot, if not you most definitely should..
As I may well have mentioned to you before, glassware is important to me and when I’m out at a bar or pub or wherever I have been known to throw a hissy fit after my beloved beer has not been given the respect it deserves. Just because it’s a foreign beer it does not mean that any old foreign branded glass will do. It’s not about branding either, although I do think it helps with the overall experience. With some exceptions, for example an Orval chalice should only ever be seen with a nice foaming domed head of Orval in my opinion. But as with Orval, the shape of the glass has been designed with the particular beer or beer style in mind and that should be considered when you fill it with a tasty beverage. Check this brilliant info-graphic taken from the Brookston Beer Bulletin for examples. The item in question is the stemmed glass on the right, listed as a stemmed pilsner glass, for me it’s more of a tulip-goblet hybrid and is perfect for aromatic IPA’s and such as it holds a good amount of beer, allows enough space for the head and most importantly focusses those lovely aromas. For this reason alone I was really excited to hear the news late last year that Spiegelau were collaborating with Sam Calagione of Dogfish Head and Ken Grossman of Sierra Nevada to create the perfect IPA glass. “Designed to showcase the complex and alluring aromatic profiles of American “hop forward” IPA beers, preserve a frothy head, enhance taste and mouthfeel, and present a comfortably wide opening for the drinker to savour each beer”. So, despite my ever beer suffering wife’s plea for “no more beer glasses” I ordered some, and tonight am putting the new grand design to the test, head to head against the incumbent champion. As a first observation before beer hits product, there’s a lovely feel to this glass, the precision edged lip is great as always, plus you have the slightly ridged base which feels good in the hand. The design also addresses perhaps the only flaw I could raise with some of the taller designs in that it is base weighted, these glasses are really fine, incredibly light and normally could easily be blown over in a breeze, this feels solid. For the head to head I’m going to use a beer that I know should really benefit from the work that has gone into the design, it has an awesome aroma profile, full on taste and most importantly I know it is as fresh as fresh can be as it was direct from the brewery, Axe Edge IPA from Buxton. Whilst there was nothing scientific about this test the beer was served at the same temperature, just chilled enough to try and maximise the aromas. At this point I should mention that my first worry about the design was unfounded, at first glance I thought it would be a nightmare to pour beer into, but on this first try at least, there was no problem at all. After several passes of each on the nose I have to say it’s one nil to the new boy, Axe Edge is a proper tropical fruit fest anyway, but this really boosts those aromatic fruity notes right out like an Dyson-air powered hop cannon. Surprisingly it wins on taste too, the difference isn’t huge but is noticeable unless there’s just a “new toy” placebo effect going on here, but I think not. Aroma and taste being linked, it makes sense that a glass that by design has a ridged inner surface to continuously boost aroma whilst you drink will push that aspect as you take beer into the mouth, that’s my theory anyway. 2 – 0. To complete the clean sweep and to reiterate my earlier comment it feels great, I really like the feel of my old faithful goblet but this somehow just feels right, substantially chunky at its base to feel comfortable to hold without transferring too much heat from the hand, but remaining delicate in the upper body so as to keep the drinker, you and I, fully aware that this is no ordinary drinking vessel. Plus to top it all off the head retention, I assume being topped up by those clever ridges was excellent too, staying intact long after the other had subsided. The verdict, well for me it’s pretty conclusive, for IPA’s at least this is my new glass of choice but I’m a glass geek for sure. Should you buy some, well that depends on how much you experiment and how much you are willing to spend and what you prefer to drink? The four glass set covers lots of styles and retails at about £30 direct from the website or from Amazon, whereas the twin pack of IPA specific glasses is £15, I’d happily recommend both to anyone serious about their beer. If it helps to sway you though, both Sierra Nevada and Dogfish Head are donating all of their portion of proceeds from sales to hop research, a worthy cause for any hop head. I’m off for a refill..
I’ve been wanting to do this for a while but have never managed to get round to it, start to age some beers that is. It’s taken so long for two reasons really, time and lack of it, plus the fact that I’ve never had enough beers that fit the bill around long enough to start..
It’s nothing to look at I know, just an old beer delivery box, but once filled, sealed and placed in a coolish dark place, I’m confident that it should provide a decent enough environment which is about as close as I can get to a real beer cellar. For those who have not ever tried this before, I am reliably informed that basically you just need somewhere with a pretty constantly cool temperature without too much fluctuation. It also needs to be dark or at least certainly not in sunlight to prevent the beers getting light-struck. Beer choices are partly trial and error and some through research. Some beers suit ageing better than others, high alcohol Belgian Trappist beers for example, but avoid anything light and hoppy as they really need to be drunk fresh. I’ve thrown a few in here that may not really fit the bill but as it’s a first time attempt then I’ll learn as I go. So what’s in the box so far? 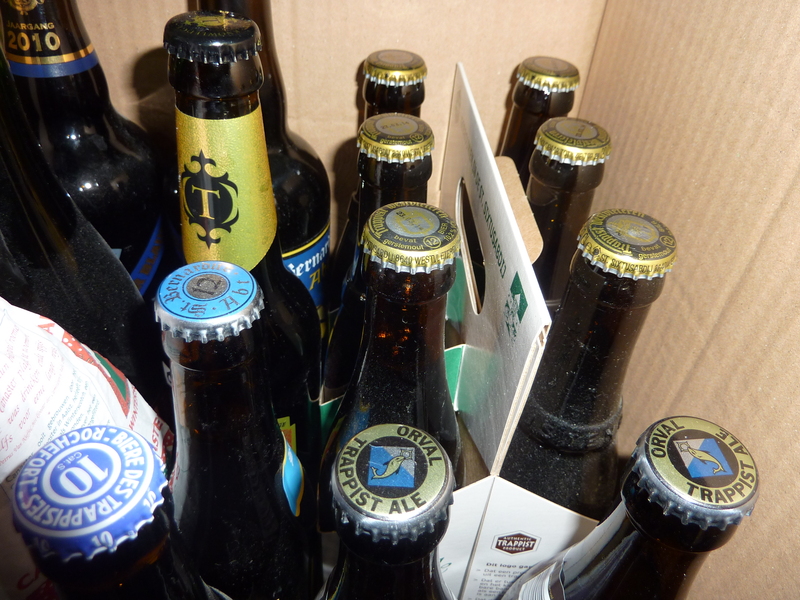 2 x Orval, Rochefort 10, Chimay Blue, Hoegaarden Grand Cru. 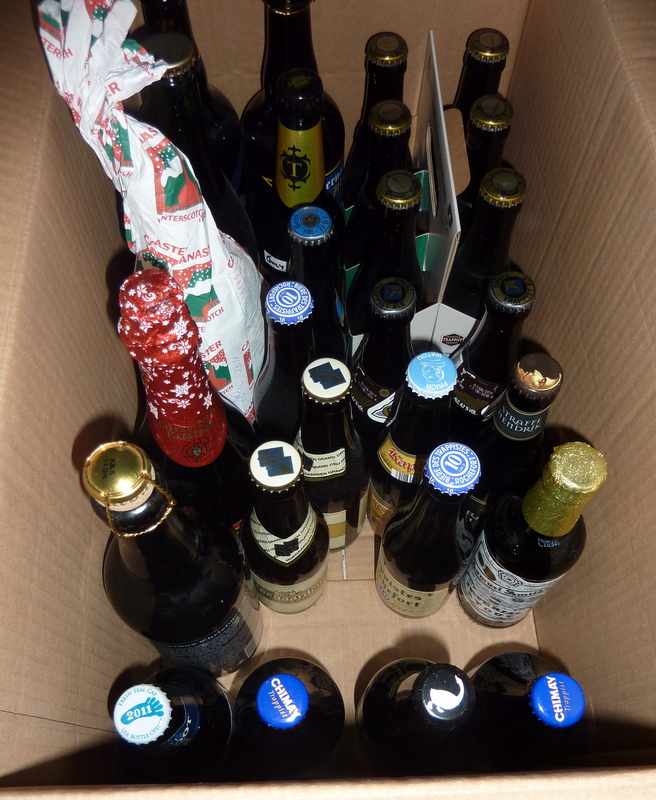 Large bottles of Achel Bruin Extra, St Bernadus 12 and St Bernadus Christmas, De Glazen Toren Canaster Winterscotch, Leffe Christmas and Gouden Carolus Cuvee Van Der Kieser. Then single small bottles of Goose Island Pepe Nero, Samuel Smiths Imperial Stout, Kapitel Prior, De Halve Maan Straffe Hendrick Quadruppel, Sierra Nevada Bigfoot, Thornbridge St Petersburg, St Bernadus 12, Robinsons Chocolate Tom and finally a Brooklyn Black Chocolate Stout (the last two are not pictured). I’d definitely be interested in comments and suggestions from beer enthusiasts, brewers, publicans etc, in fact anyone really with knowledge or experience to share as to how you think this will work out, have I made any glaring errors for example. 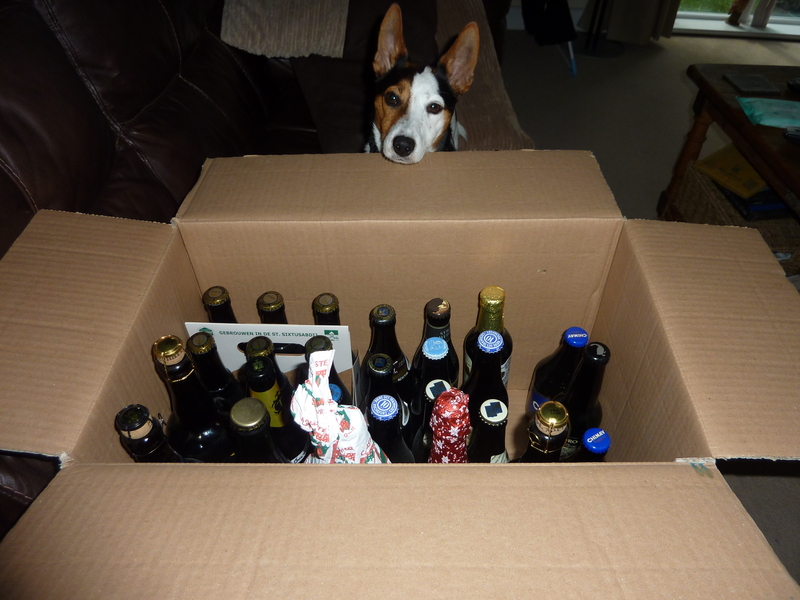 Are there any MUST HAVE beers that just have to go into the box (there are a few already in mind)? Are there any beers already in there that you just know already are not going to improve and I may as well just enjoy now? How long, is too long (or not long enough)? I am learning here, so any input will be gratefully received.. This weekend took on a bit of an unexpectedly international feel, first off there was a Welsh theme on the bar at The Bulls Head in Burslem, where most of the guest beers were from Powy’s based “Monty’s Brewery. 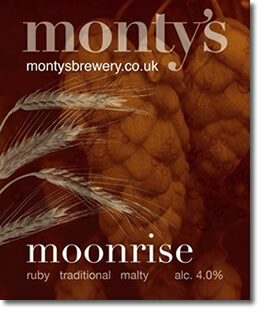 There were several Monty’s brews on tap over the weekend, but for me the best I recall tasting or at least the one I drank the most of was the “Monty’s Moonrise” which was a copper malty ale at 4%. I didn’t really take much in about each of them detail wise as I was just lazily drinking for pleasure rather than with an intention to review, but you can check the details at their website linked below. It’s an interesting read as the brewer and owner Pam Honeyman has only been brewing since 2008, this after leaving her old career which led from being a primary school teacher to an Age Concern Chief Officer. A dream move for any beer enthusiast and one that has worked out well as these beers are quickly gathering a reputation for being top notch. Now to Scotland where I was thrilled to be asked by the well respected and established Scottish beer blogger “thebeermonkey” to do a guest review, this is going to be a joint venture and hopefully grow to include collaborations from other writers and beer enthusiasts. You can check the review out using the link below, it was for a surprisingly excellent American Stout by Sierra Nevada. A real big thank you to The Beer Monkey for the opportunity and support. Staying in Scotland we come to my beer of the week from BrewDog in the form of their 5AM Saint. It’s an amber ale and has the most fantastic aroma and taste which reminded me of lychees amongst other things. I only had one bottle which was a damn shame as I could have downed ten. A real find with the added bonus that it’s easily available at Morrisons at around £1.85, a snip as it’s awesome. “5am Saint is The Holy Grail of red ales.We live in a world of disposable deities. Someone, somehow has managed to press that big, flashing moronic override button and we are hard wired straight into the pockets of false idols trying to make a quick buck. Sadly, for a lot of people the same mentality applies to beer. But who is to know what is worth worshiping when monolithic advertising budgets have you sucked down the rabbit hole in the blink of an eye?